When Pam Benoit, the third of four finalists hoping to become the campus’ next chancellor, spoke at her open forum Monday, she presented evidence of a strategy implemented at Ohio University that increased enrollment. Benoit, executive vice president and provost at OU, is also the sole finalist for the chancellor position at the University of Colorado Denver after two of the top three finalists withdrew, according to OU’s student-run newspaper, the Post. She visited CU Denver on April 28 and 29 for her open forum interview for the position, the paper reported on Friday. Enrollment at Ohio University has increased from 30,000 to more than 38,000 since Benoit became Ohio University’s provost in July 2009, Meera Komarraju, co-chair of the chancellor search committee, said during her introduction of the finalist. Benoit said OU created a five-year enrollment plan for students, including transfers, ones from out-of-state, in-state and community college students. To better recruit people attending community college, Benoit said Ohio University places “relationship managers” on the 19 campuses OU has partnerships with. She said while SIU is on the right track, there is room for improvement when retaining students. Benoit said Ohio University has professional advisers to accomplish this. Asked about strategies she would implement to improve the university’s connection to the city of Carbondale, Benoit gave examples of how OU does this, noting she meets with the mayor of Athens, Ohio, to discuss projects about cleaning the city. She said Ohio University staffers and city police patrol streets together during Halloween. Benoit — who earned a master’s degree in communication from Central Michigan University and a doctorate degree in communication from Wayne State University — said unfortunately, she has experience regarding budget cuts. Benoit said the scenarios were then shared by spreadsheets with the entire campus, and OU held open forums to discuss the changes. OU’s administration took more cuts during this process, as opposed to injuring academic units, Benoit said. 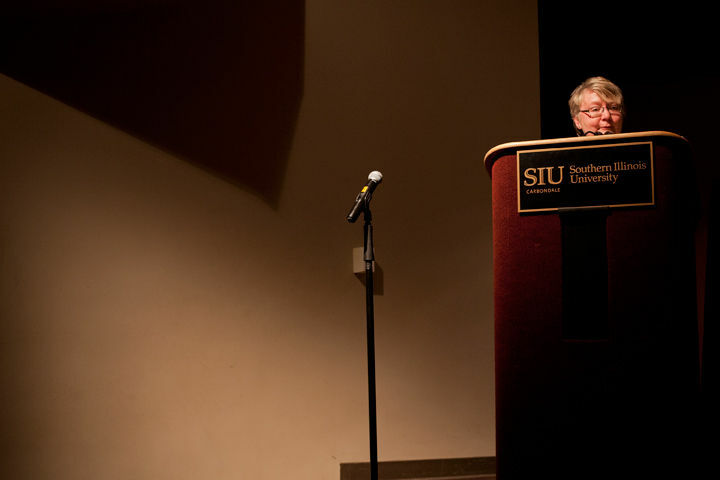 The university froze positions instead of eliminating faculty or taking furloughs — like SIU did in 2011— although some staffers were cut, she said. Asked about student engagement, Benoit said she participates in open discussions with students called “pizza with the provost,” where people openly ask questions and talk about campus issues. While she did not speak about her personal life as much as the first two candidates, Benoit — who described herself as an optimistic realist — is a first generation college student. She said her parents saved money so she could attend school. “They did not understand what it meant to go to college other than to say that they knew that it was extremely important to have a college education,” she said. Asked about what gives her a unique advantage above the other candidates, Benoit — who was appointed vice provost for advanced studies and dean of the Graduate School at the University of Missouri in 2006 — responded: “I’m a mediator.” While at Mizzou, she completed training to become a certified mediator at the university’s Center for Dispute Resolution, she said.